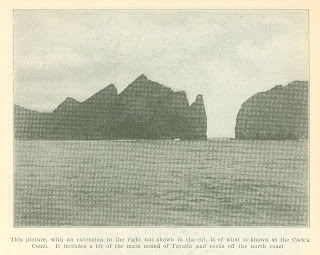 Tau, Manua, is the most beautiful of the islands viewed from the water, and so com­pletely is it out of the line of steamers or any merchant ships that visitors are very rare indeed. There is no way for tourists to reach it except by a special trip, so it retains much of t hat strangeness and novelty which are fast disappear­ing from Tutuila and Upolu, where mail steamers reg­ularly stop. 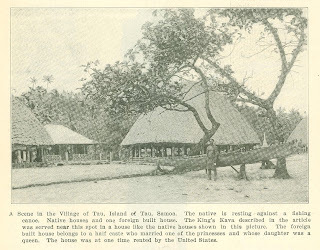 Early one morn­ing we left the har­bor of Pago Pago on the Island of Tutuila, and reached Manua that afternoon, anchoring off the little village of Faleasau, on the Island of Tau. The principal village, Tau, was a mile or so around a point of the island, so I spent what remained of that day studying the rocky mountains, which come down to the very ocean, and are washed so high up by the tremendous breakers that I fancied at one time they must have been the fortress of some old chief. The fol­lowing morning I was invited ashore to the village of Tau. It required some little courage to land, for it had to be done in an open boat over the surf. The fita-fitas, or native guard, came from shore in a long boat for us and rowed us around the point of land which hid the village from view, and then the ex­citement of surf-landing commenced. So well do these people understand the navigation of the huge waves that roll in from the ocean, that as each wave approached the boat was pulled with it, and the wave carried it in, then the boat was held back until the next ap­proached, and again we mounted and rode the wave, until we were finally landed in safety on the white sand. As a white woman and child are curi­osities in Tau, I had several times dur­ing my stay to call in the assistance of a fita-fita to prevent my little boy from being smothered by admiring children. We were escorted to the Governor's house, which is a native fale, and there were met by the ex-King, Tui Manua, who made us welcome in native Samoan, as he does not speak English. He is a fine specimen of a Samoan chief, edu­cated and very dignified. His wife, the ex-Queen, approached and sat with us, and later I went to spend an hour with a high chief's wife, until luncheon was ready. Soon after luncheon we heard the sound as of a horn blown from far away in the mountains. At the same time we were called out of the fale to see the natives assembling for King's kava, which was to be celebrated in honor of the new Governor. On reach­ing the beach I saw that, instead of from a horn in the distance, the sound came from a huge shell blown by the King's forerunner, and I learned it was for the purpose of calling the people to witness the serving of King's kava. The fore­runner was above the average size, and his body and arms shone with cocoanut oil like polished bronze. He had around his waist one of their famous fine mats, which reached to his ankles. These mats are their heirlooms and are very valuable. The one he wore was so large that, folded as it was around him in plaits, with the deep fringe at the bottom, it stood out like a ballet girl's skirt. Around his neck and waist. were strings of red sea beans and shells. Around his ankles were garlands of green vines, and his head was festooned with so many fringes - made from banana leaves that his face was nearly covered. The shell be blew was about a foot in length. 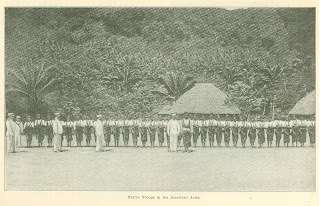 Behind him came all the villagers from surrounding towns marching up to the large fale, where the officers from the ship and all of the high chiefs were awaiting the arrival of the American Governor and native Governor or ex-King. We entered the fale and found chairs placed for us on one side of it. Samoans always sit on the ground cross-legged. The rest of the room, except a space for the ex-King, was reserved for high chiefs. The fales are circular in shape and have very high sloping, thatched roofs covered with cane. One has to stoop to enter. The chiefs were sitting, around the edge of the room with a space left for Tui Manua. He at last entered quietly and sat alone. The talking men then commenced the ceremony by an ex­change of compliments. They expressed their gratification at having the new Governor with them, as well as the of­ficers. Again they told us of their love for the United States. Suddenly out­side there commenced a great shouting and noise of hand clapping. On looking outside I was surprised to see the great number of natives seated all around everywhere. Noticeable among these were the young chiefs dressed in their brown tapa lava-lavas, with strings of gayly colored beans or flowers around their necks. I inquired why the women did not enter the fale, and was told that they were not allowed inside at this ceremony. I heard men running, and suddenly about eight tall young chiefs rushed in and threw an entire roasted pig at the Governor's feet and invited him to partake. He signified his willing­ness to do so, and accordingly it was cut apart before our eyes and, according to rank, each of us was served, certain parts being always reserved for the per­sons of high degree. Fortunately for us taro and bread fruit were also offered, so we could really eat something, for it would be asking too much to expect the uninitiated to eat pig roasted faa Samoa. Again we heard the shouts outside and the young chiefs rushed up into the bush to cut and bring down the green kava root, from which to make the King's kava. This they grated while the surrounding people sang, the while continuously clapping their hands as an accompaniment. Kava is ordinarily made by the taupo, or maid of the vil­lage, but King's kava is made by high chiefs. 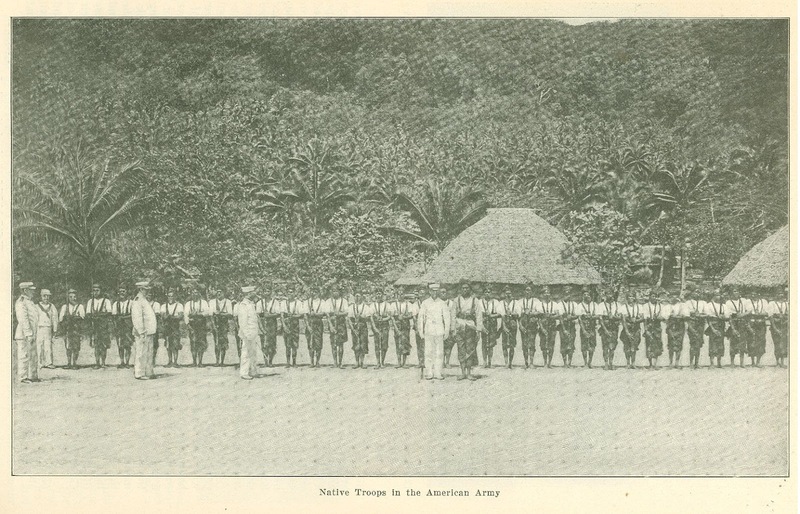 When the kava was grated and ready, nine wooden bowls with short legs were brought in and placed in front of nine high chiefs, who sat in a row in front of us. The grated kava was di­vided among them and then water was brought to them in cocoanuts. Each was then provided with a soft bunch of fiber made from tree bark. This they stirred around in the kava and then squeezed out and tossed to a man outside, who, in time to the music, shook it and thus removed all the tiny particles of the grated root. This was done re­peatedly until the liquid was thoroughly strained. Then the singing changed from a monotone to a more lively air and the clapping became faster. One of the chiefs inquired, "Where is the King's cup, that he may be served?" Immediately there arose such a shouting as I never heard before. All the young chiefs, with war clubs in their hands, rushed down the village, knocking down or destroying anything which prevented their making a straight line for the taupo's fale. She had the cup, and in­stantly the shouts ceased and singing began. The taupo left her fale and, es­corted by the young chiefs, walked up the village street. Her costume was a strange combination, half barbaric and half civilized. She was dressed in a fine mat as soft as silk with a border of little scarlet feathers above the fringe at the bottom. Her body and arms shone with cocoanut oil, and a narrow strip of black English crepe was drawn tight over the bust and tied in a hard knot between the shoulder blades. Around her neck were hung many chains of shells and beans, and around her throat was a collar made of boar's tusks. She was crowned, not with the customary wreath of flowers or ferns, but, alas, with some tourist-bride's cast off wreath of orange blossoms, probably gleaned on some visit to Apia. Straight as an arrow she walked in solemn dignity. Her left arm hung down at her side, but her right arm was stretched straight out from the shoulder, palm upward, holding the King's cup. For about three hundred yards she walked and her arm never wavered. To enter the fale she had to stoop, but her arm kept its rigid posi­tion. She faced the King a moment and then turned to the kava makers, and they took their cups, filled them from their bowls and then in unison they raised them high and poured the contents back into the bowls. All this time her arm never trembled. At last the signal was given and she approached them. As these nine chiefs lifted their cups to pour the kava out the taupo stooped and, moving her arm in a semicircle, without bending at the elbow, caught in the King's cup a few drops from each chief's cup until it was full. Then she pre­sented it to the King and he emptied it at one draught. How glad I was when at last her arm could drop! From her face no one would ever imagine that it required skill or caused fatigue to do this, but I am told it requires continuous practice to carry and hold the cup in this way, as one can well understand. In olden times the cup from which the King drank was immediately broken to fragments. This was not the case, however, on this occasion, for after he finished we were all served from the same cup in a simpler but similar way, and so the ceremony ended. After this I wandered about the village until time for the siva, or native dance to which I was escorted by the ex-Queen, who presented me with the usual gifts of siapa, fans, and chains, or lais, as they call them. Shortly before sundown the boat was ready to take us back to the ship, and with many attempts to express my appreciation of their hospitality, I entered the boat and again we mounted and rode the waves. Even now I can hear their deep voices call to me "tofa" and "soifua." Originally published in the Independent Magazine. June 18, 1903.